Last Friday began another writing challenge for me this year. Oodles of words have been read and written thus far, but I’m enjoying the process. My project this summer, in tandem with all the WriMos I can count, is to continue my Fractured Tales Series. I saw an anthology submission call for a retelling of any fairy tale. I stormed the brained and ended up coming up with more than one idea–sound familiar? I ended up with so much story that couldn’t be contained in 7500 words or less. 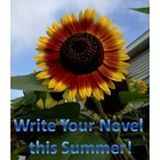 Of course, when April came along with challenges such as Camp NaNoWriMo and Savvy Authors Boot Camp, I decided to make it a full-on novel. I already had one story being written for Boot Camp and when I couldn’t decide on the Pied Piper themed story or Sleeping Beauty, I decided to do a mash-up. Cut to May. 75K for this mash-up but the subplot started to creep to the forefront. It demanded its own story, so I figured, why not? I’d like to wrap up 2013 with a series I can be proud of, spend the holidays polishing and start the New Year with a publishing twinkle in my eye. Wrote just under 20K this week, but after a lengthy assessment, I found about 7K of it Series worthy. I can always put the other words to good use later. My beautiful Keysmashing Tots had fevers this week. It’s hard to write on a daily basis when your nephew and niece compete for your attention–with each other or as a distraction so they can climb onto your lap and have a go at the computer. The duo was aptly named. But the amount of sleep I haven’t had this week put a dent in my creative plans. As I’ve said before, TKT trump everything, so my writing time, though diminished, still happened, but my three hour window was cut in half. Sometimes I just had an hour to get the words out. I’m home for the long weekend to recharge my own batteries and it’s odd (though hardly surprising) that I now find their absence to be a greater distraction from writing. I have two days to keep adding to my June word count–hoping to break 70K–and prep for Camp that starts on Monday. It’s a long road ahead but the journey is the best part, don’t you think? This entry was posted in FRIDAY FORAGE, Writing/Reading Challenges and tagged AND THEN THERE WERE SEVEN, brainstorming, Camp NaNoWriMo, Fractured Tales Series, HAMELIN, JulNoWriMo, JunoWriMo, Savvy Authors Boot Camp, THE CURSE OF BRIAR ROSE, word counts, WRITE YOUR NOVEL THIS SUMMER, writing challenges, writing goals. Bookmark the permalink. I want to read your books someday! I’ve always wanted to re-write a fairy tale but haven’t gotten around to yet. I love the idea of turning those old stories on their heads!